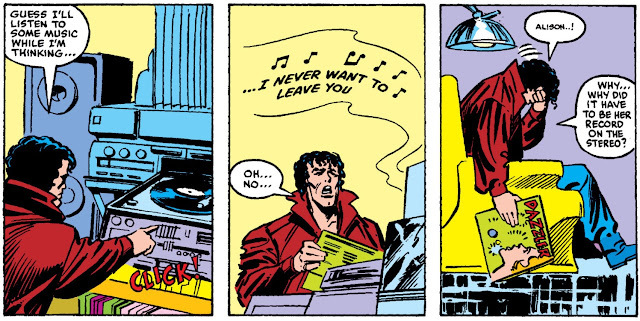 The Beyonder’s experiments into the nature of human desire has left him in a low place. His plan to court the mutant Dazzler backfired when he fell in love with her, but she rejected him. Now he’s a supremely powerful being having to deal with the ache of romantic rejection (and the pain of a bad hairstyle). The first few issues of the series were interesting because of their ambition, and the overall approach Shooter was taking with the series, but the stories themselves were a little bit tedious to get through. The third issue got a little more entertaining, with all the strippers and pimps, but things really got going in the previous chapter, with the Beyonder thinking and behaving more like a normal person. Will that trend continue? There’s only one way to find out. 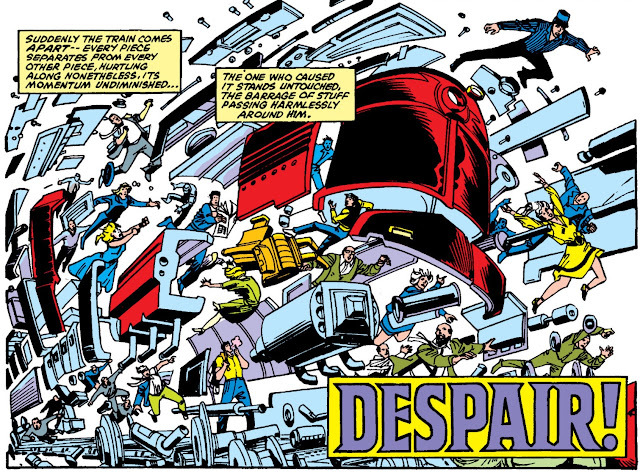 The Beyonder strolls along a railroad track, when a train comes barreling down behind him. He reacts in typical Beyonder fashion, disassembling the train and sending the parts, and passengers, soaring harmlessly past him (instead of, you know, taking a few steps to the side). 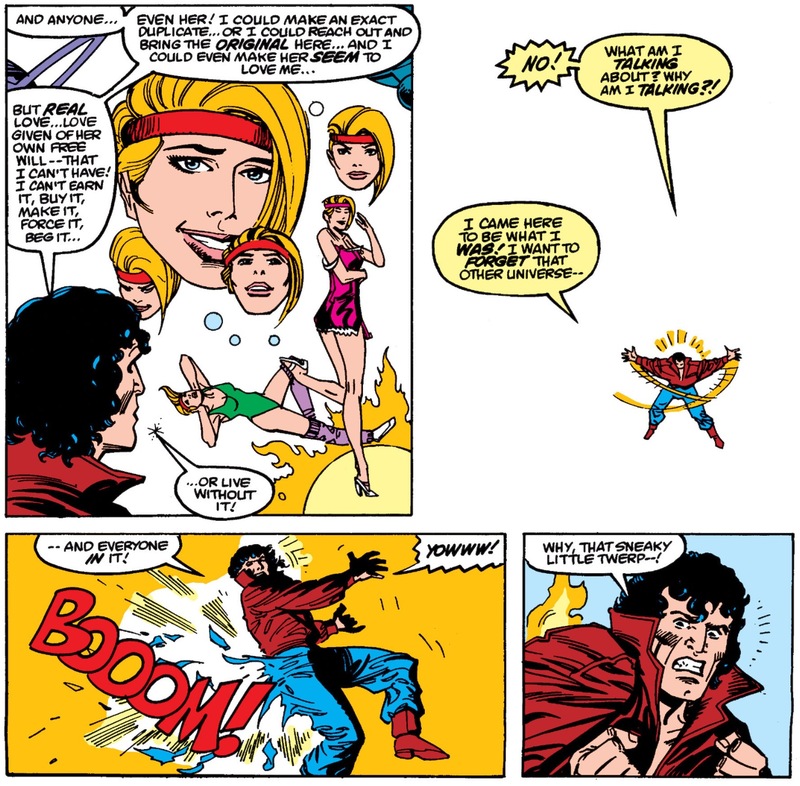 In the confusion, the Beyonder continues along his path, and a young girl comes running up behind him. Her name is Tabitha, but everyone calls her Boom Boom. She’s a mutant (some would say the greatest mutant) and was heading to some school for mutants she heard about up in Westchester, New York (but they’re wrong, she’s the worst). Boom Boom’s mutant power is the ability to create “time bombs” made of energy (but her real skill is in never stopping talking). 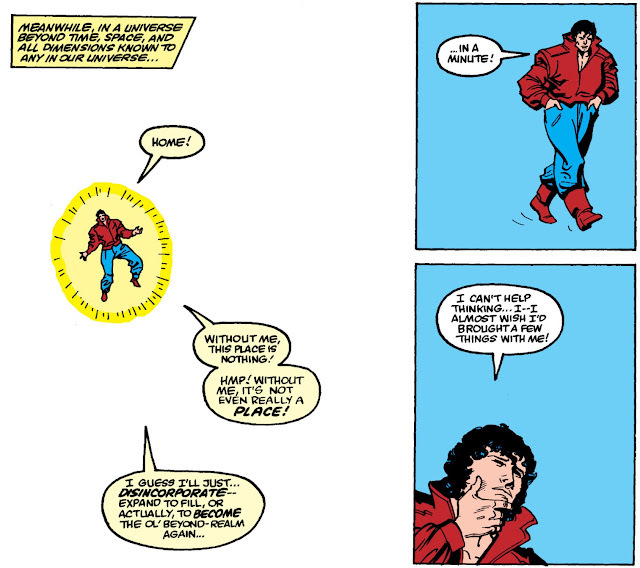 The Beyonder disagrees, and has deciding to return where he came from. She gives him a hug goodbye, and after he leaves, breaks down in tears at the prospect of being alone again. The Beyonder arrives in his empty dimension, but it’s not the same. He feels like maybe he should have brought some things, and then some more things, but it doesn’t matter because he can’t bring her (Dazzler). At least, not of her own free will. 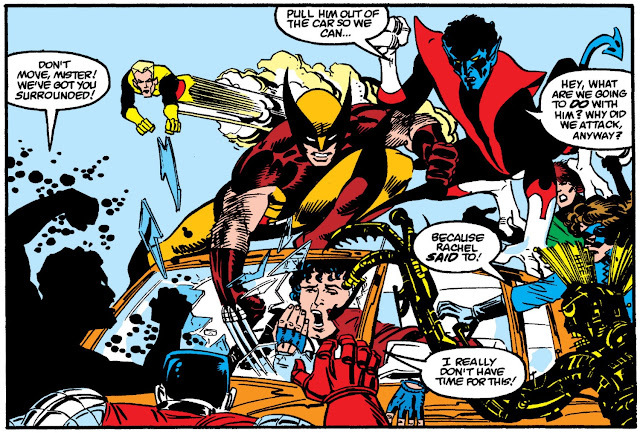 The next day, Boom Boom is hitching for a ride on the side of the interstate, when Beyonder pulls up in a car and gives her a lift. To show he’s not mad about the prank, he heals her black eye. They arrive at the school, and Boom Boom gets out, walks up to the door, and knocks. Before she can even finish introducing herself, the X-Men spot the Beyonder, and rush past her to attack him. He’s little more than bored at their efforts, and sends them all tumbling away from his car before speeding off. 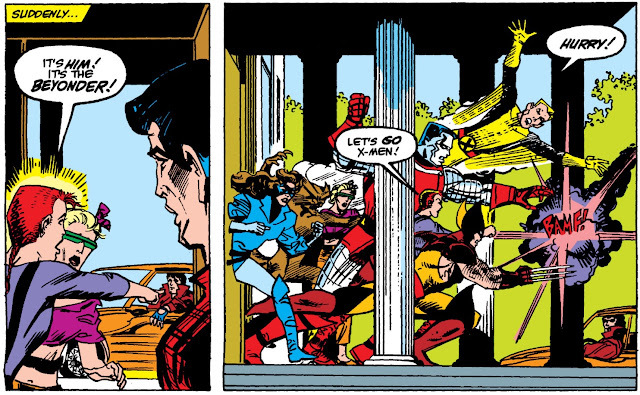 The X-Men chase off after him, leaving a distraught Boom Boom all alone, running off into the forest crying. Some time later, the X-Men return, unsuccessful, more concerned with their petty internal squabbles (a trademark of the franchise) than the young mutant that had been on their doorstep a little bit earlier. Boom Boom calls for the Beyonder, but he doesn’t come. She creates the biggest bomb she can, threatening to let it go off and kill her if he doesn’t show up. Tabitha clutches the bomb tight (please kill her) until it goes off in a flaming burst of energy. But the Beyonder finally arrives, saving her from certain death (damn you). This time she was the one ready to quit, after facing rejection at the hands of other mutants. 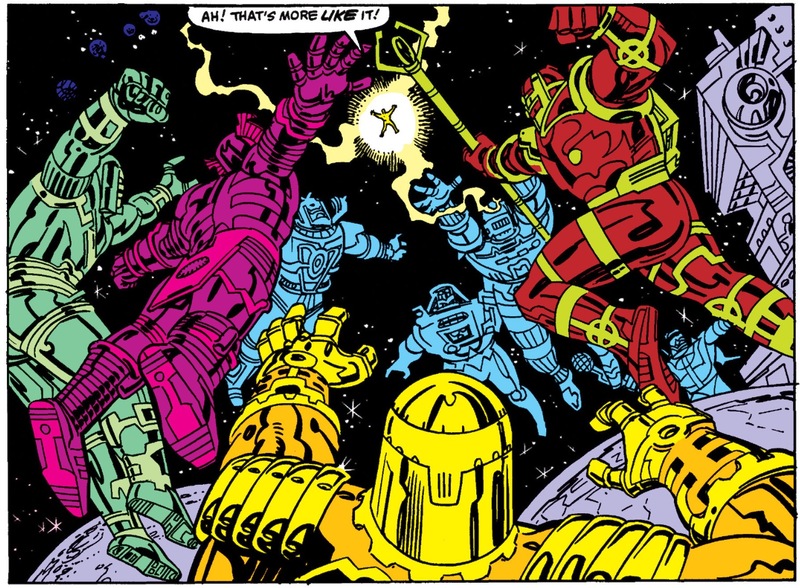 The Beyonder isn’t all that impressed with the Celestials, believing that they just stand around worrying about the universe but not actually doing anything about it. 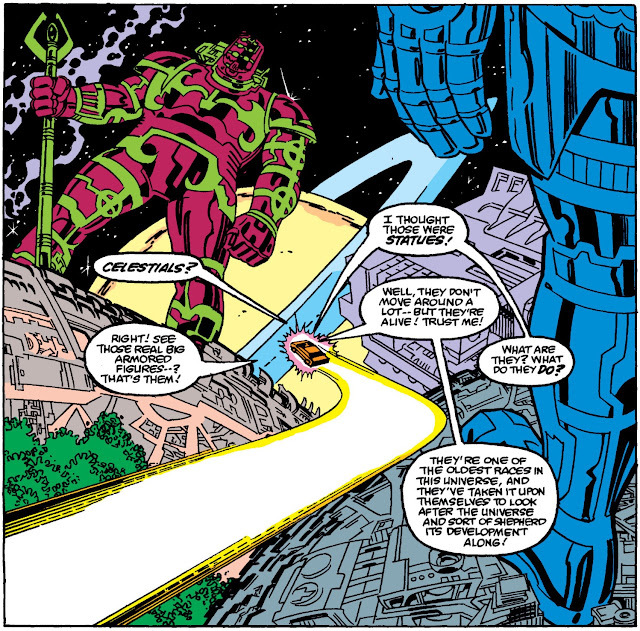 So, they go to “the boardwalk,” a tourist trap that alien races built around the Celestials. After having a few alien hot dogs and sodas, Boom Boom gets the Beyonder all riled up about how the Celestials didn’t seem to notice him. He claims that he’s all they’ve been thinking about, and flies up to challenge them by threatening to destroy the universe, unless they stop him. …and in a display of his ultimate power, The Beyonder repels them all. I don’t care what you think of this series, that was impressive. In a cosmic battle that regular beings can barely comprehend the full scope of, The Beyonder eventually stands triumphant. 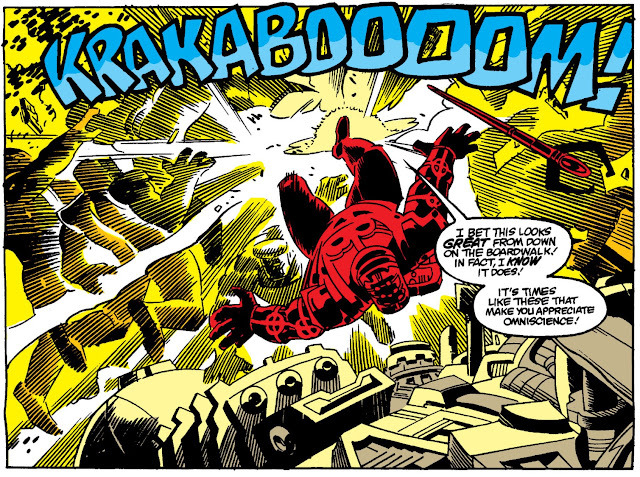 Boom Boom is understandably shaken up, frightened of his willingness to destroy the galaxy to prove a point. He tries to win her back, by offering to make her more attractive, or older. But she wants no part of him anymore, and demands he return her to Earth. He does, and then after cruising around the universe for a bit, returns to his mansion in Brazil. He checks in on a few of his projects, like Algrim the Elf, before turning on his record (ha!) player to listen to some music. Little did he realize that Dazzler’s album was the record cued up to play. Beyonder sad. Meanwhile, Boom Boom calls the Avengers, to warn them of the omnipotent being that is more than a little bit unstable at the moment. 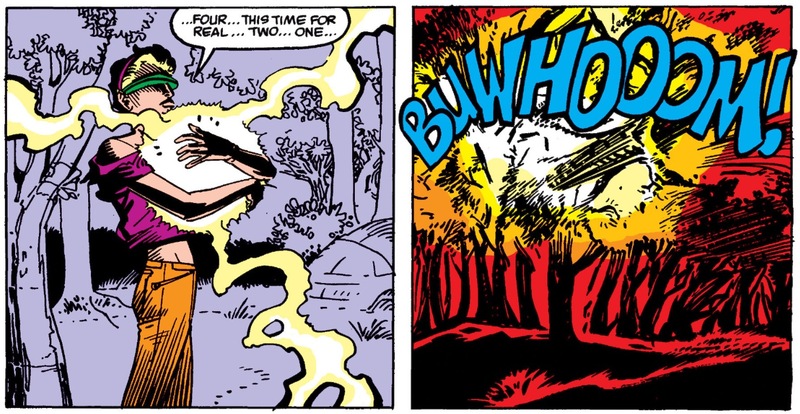 Later, at the same campsite where they first spent the night, Boom Boom calls out for the Beyonder again. He’s very happy that she called. He had even contemplating giving up before she called for him. Unfortunately for the Beyonder, it was all a trap planned by the Avengers to attack him with the combined might of a collection of Earth’s most powerful heroes. After getting no resistance from the one from beyond, Captain America stops the assault. Rejected by the woman he loves, and abandoned by his only friend, the Beyonder is a broken man. That does not bode well for the future of the universe. The Avengers let him leave, not knowing what to do. 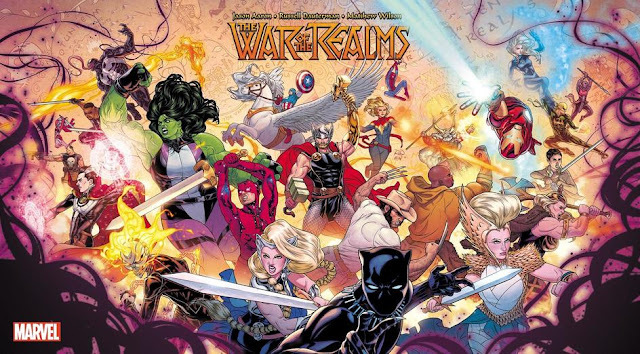 Like I said before, this may not be the mindless slugfest that many fans were looking for in a sequel to the original Secret Wars, but I think it’s been a pretty interesting experiment in exploring aspects of human existence. Most of us regular humans might go through a phase of destructive behavior after getting our hearts broken, but it usually involves getting drunk and going to strip clubs, instead of threatening to destroy the universe and fighting Celestials. (When I got divorced I read a lot of Cerebus. Which is simultaneously the best and worst thing to read when you’re angry at life. If nothing else, it’s a pretty fascinating look at one writer’s slow descent into madness. Much like this weekly column.) Sometimes that destructive behavior might push our friends too far, causing them to abandon us, which only serves to make us feel that much more alone. The idea of a depressed omnipotent being feeling rejected and alone is an absolutely terrifying prospect. I can’t even imagine what I might have done with unlimited power during the periods of my life when I was wallowing in self-pity. Will the Beyonder finally break free of his prison of sadness, and enjoy all the positives in life, or will he start wearing lots of black and listening to the Cure? Only one way to find out, next week! I remember reading this on the school bus as a little kid. For some reason I thought the girl's name was "Time Bomb" and that the Beyonder wore a purple outfit. I only saw the one issue. It's great to be able to go back and see these stories now that I'm older.